I’m James Introcaso, an ENnie-winning blogger, best-selling DMs Guild author, podcaster, and game designer. I’m here to help you design new game mechanics. In each Design Workshop article I provide the tools you need to cook-up a new piece of fifth edition D&D content. This first article looks at the basics of designing something new for D&D and walks you through creating one of my favorite pieces of the game: backgrounds. In the case of the monster background, I reviewed the backgrounds listed on D&D Beyond and saw there was nothing close. 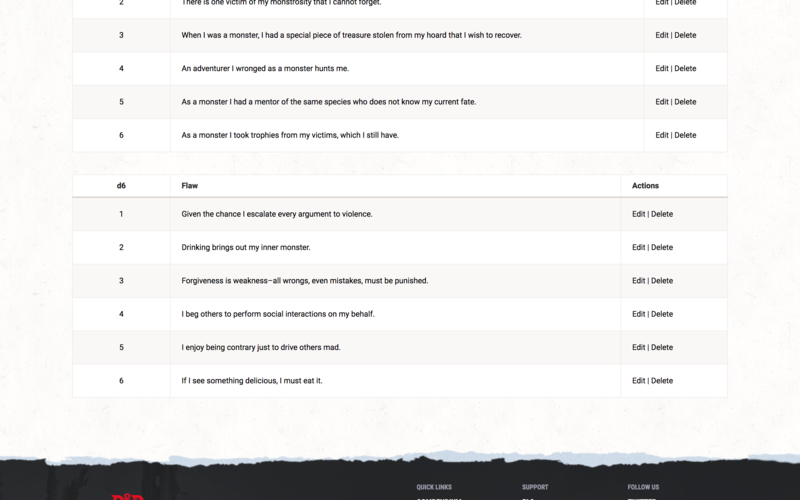 I also perused the backgrounds in the homebrew section of D&D Beyond, because why make something from scratch the awesome community already provides? 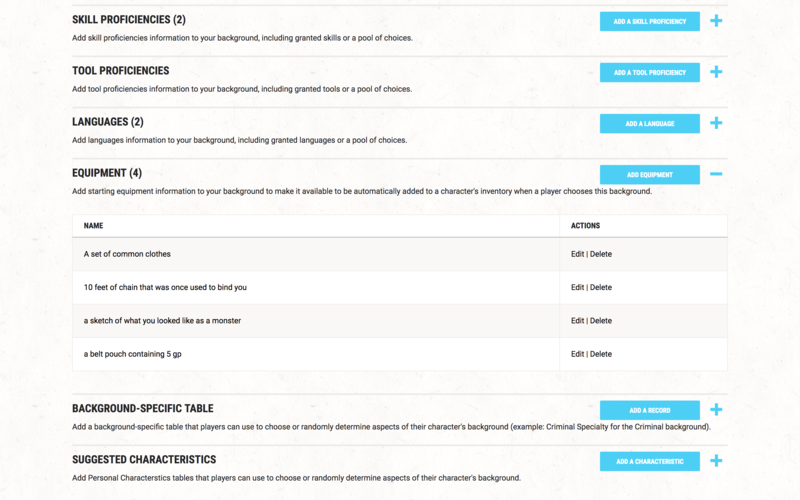 Building your background in D&D Beyond makes your life easier. 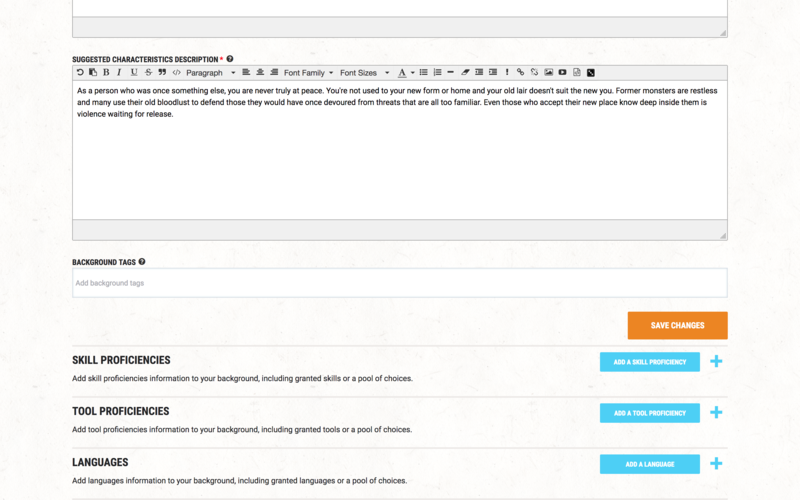 The application breaks down a background’s elements in an easy-to-use form. 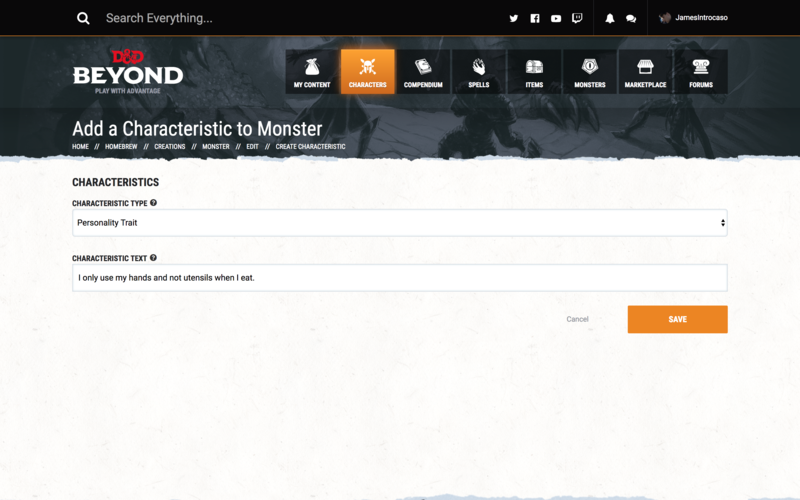 Select CHARACTERS > BACKGROUNDS > CREATE from the D&D Beyond homepage and click CREATE FROM SCRATCH to get started filling in the information for your background. In D&D Beyond add [ skill ] before and [ /skill ] after each skill name (no spaces when you actually use it). 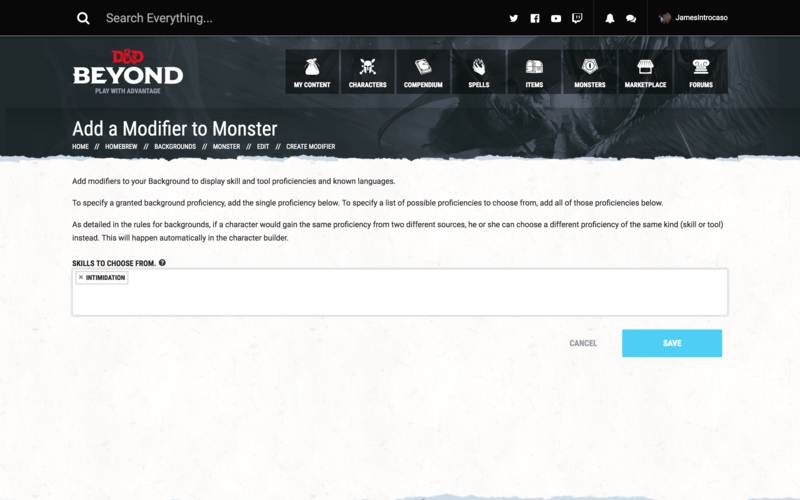 This coding language allows your background’s skills to be hyperlinked to the Compendium in D&D Beyond. 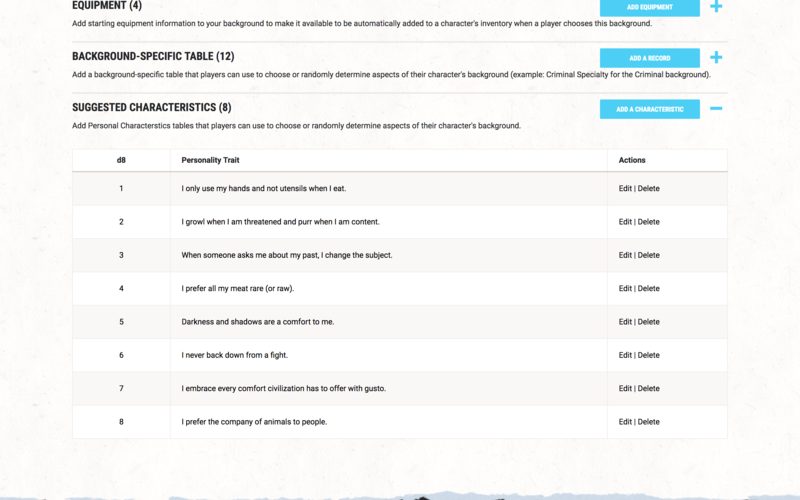 Since backgrounds are broad, many provide tables that help a player get more specific with their character’s story. 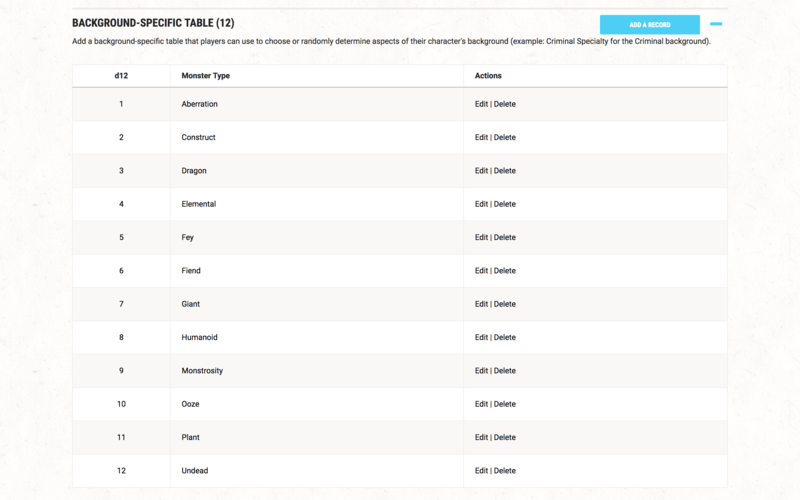 For instance, criminal background has the Criminal Specialty table that helps determine the specific kind of illegal activity the character performed. The monster background has the Monster Type table that helps determine what type of monster the character was before they transformed. 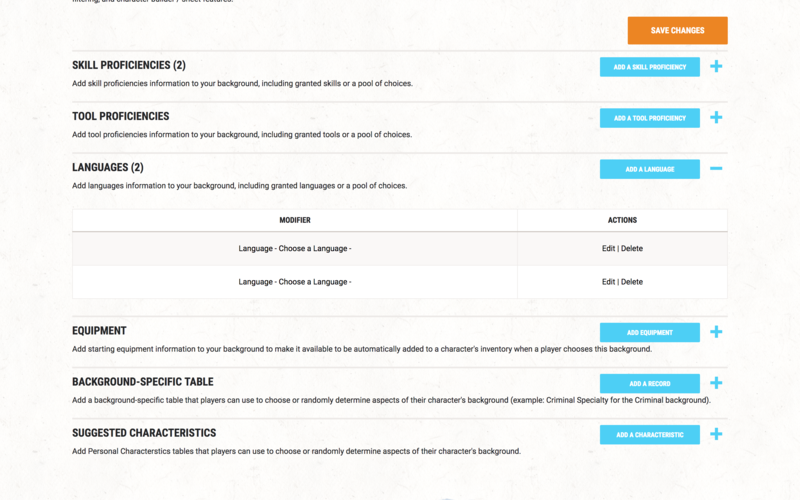 In D&D Beyond, enter your table’s introduction now and then you’ll enter the table itself in step 10. You have a reputation for being a little odd, almost as if you're uncomfortable in your own skin and around people. Whenever you act in a way that is strange or taboo, but not intentionally offensive, dangerous, or against the law, people tend to ignore you. This lets you get away with strange behavior like showing up at parties you weren't invited to, pushing through a crowd to shake a noble's hand, eating food off of someone else's plate, or taking a nap in a public place. Most people brush you off as weird, but harmless. Though your violent memories are similar to those who were once monsters, your circumstances are even more bizarre. You were once an intelligent magic weapon, wielded by legendary figures to slay countless others. Now, you're a humanoid, transformed by magic. Your previous wielders could be heroes, villains, or a mix of both. For the first time you're in control of your own. This new independence is strange but exciting! As a person who was once something else, you are never truly at peace. You're not used to your new form or home and your old lair doesn't suit the new you. Former monsters are restless and many use their old bloodlust to defend those they would have once devoured from threats that are all too familiar. Even those who accept their new place know deep inside them is violence waiting for release. 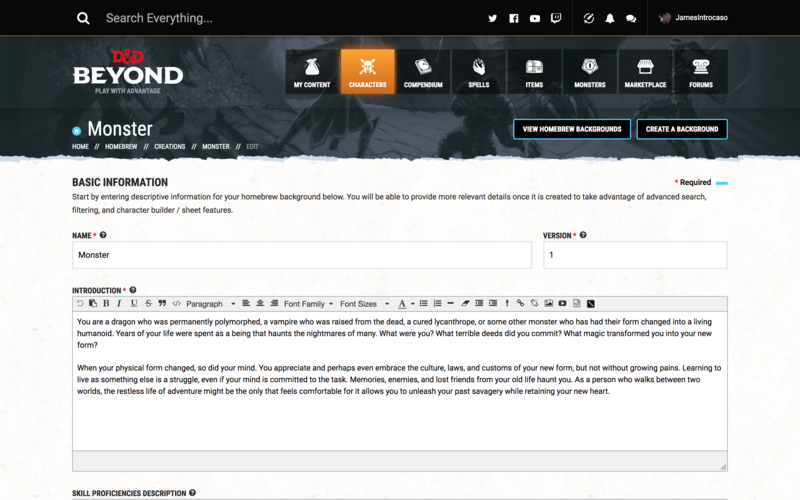 If you’re working in D&D Beyond, you’ll need to add tags appropriate for your background to make it easy for others to find. I added the MONSTROUS tag to the monster background. Make sure you click the orange CREATE BACKGROUND button. Once you’ve done that you need to add your skill proficiencies. Then add your tool and language proficiencies. Finally, add a background specific table if you have one. 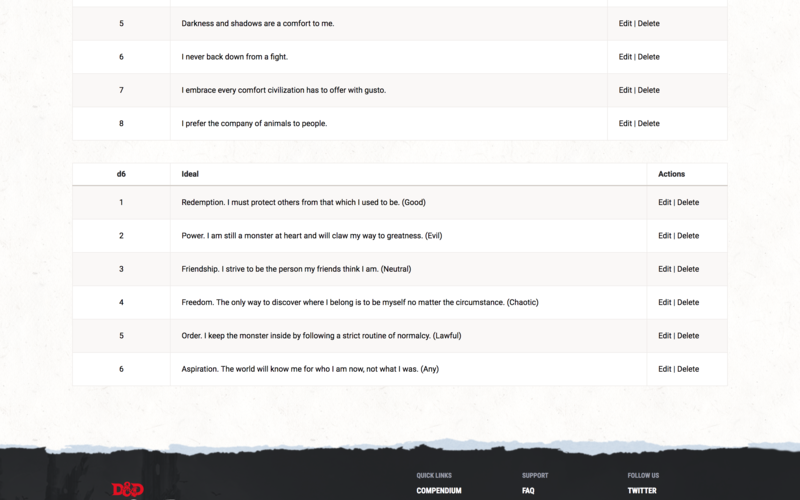 It may seem like double work, but this part is quick, easy, and ensures that when someone picks your background for a character in D&D Beyond, that all of these elements immediately populate on the character sheet. 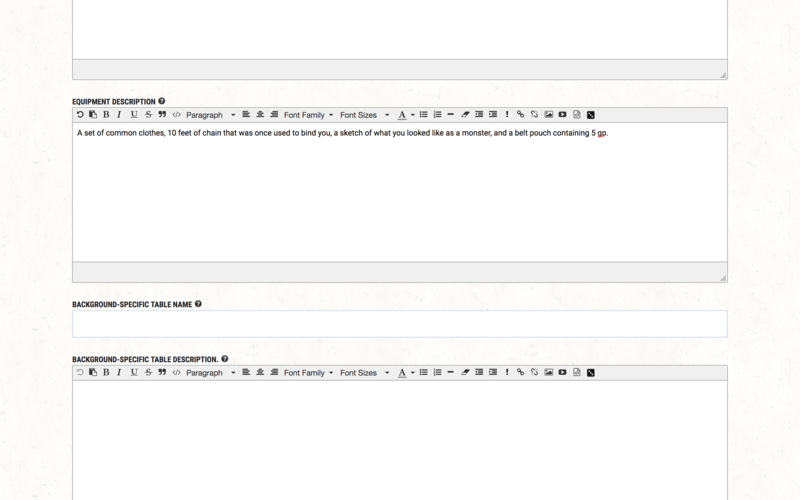 It’s time to make your work public! 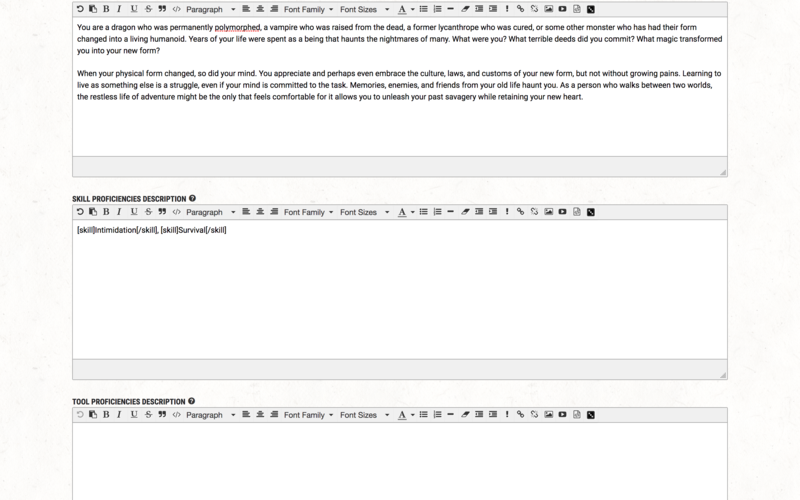 That means sharing the background with your group, posting it to a blog, putting it up for sale on the DMs Guild, or right here on D&D Beyond. 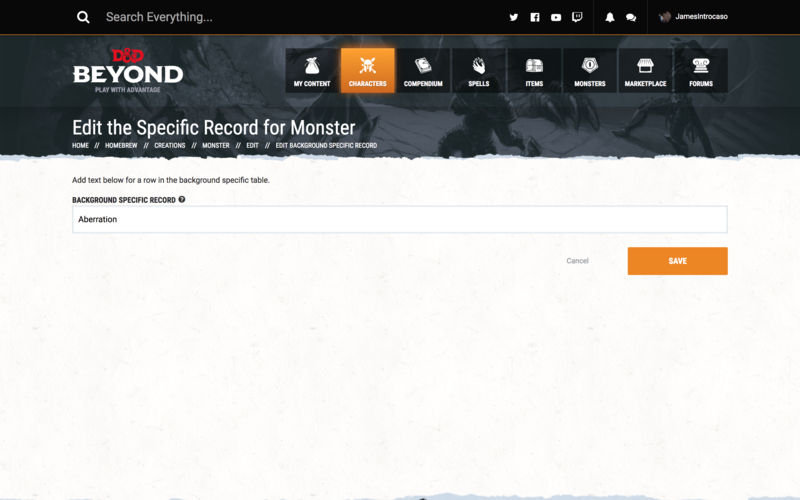 To do this in D&D Beyond go to the MY CREATIONS page, select your background, and click MAKE PUBLIC. 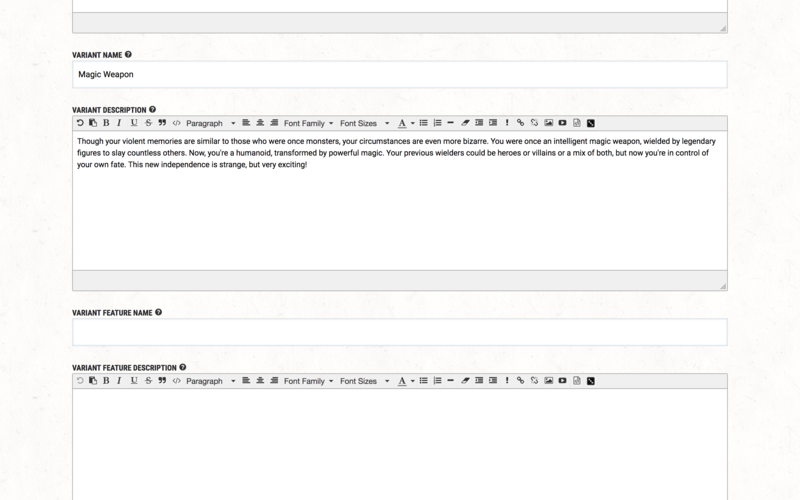 A message then appears asking if you’ve read the Public Homebrew Content Rules & Guidelines and explaining the moderation process for public content. 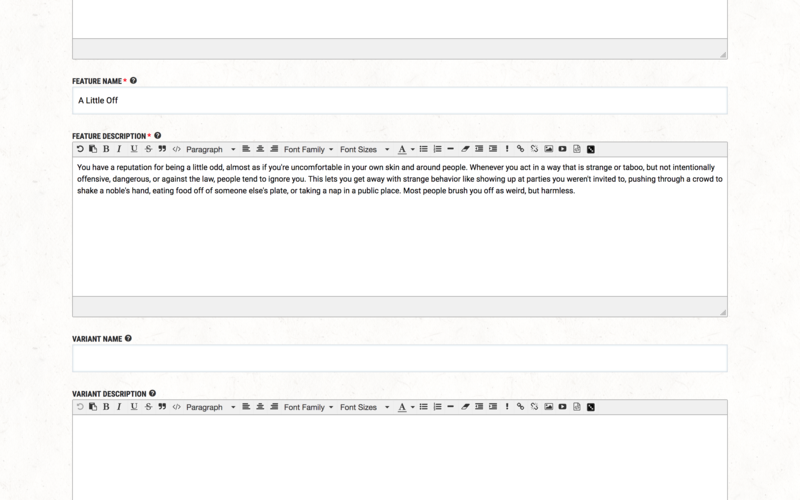 Make sure you actually read the guidelines. Most rejections happen because the creator hasn't followed one of the very simple guidelines, or because they're attempting to publish work they don't own or didn't create themselves. Please note that it is completely fine to keep your creation private if you intend to to only use it in your own game and do not wish to share it. 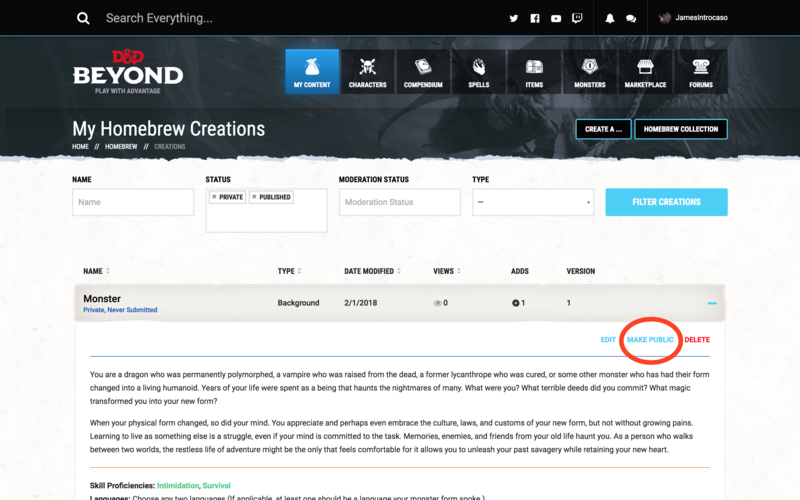 If you’re ready to submit your background, click SUBMIT and you’ll get a moderation notice from the D&D Beyond team once your background is accepted or rejected. Lucky for me the monster background was accepted. You can find the final version here. There you have it! 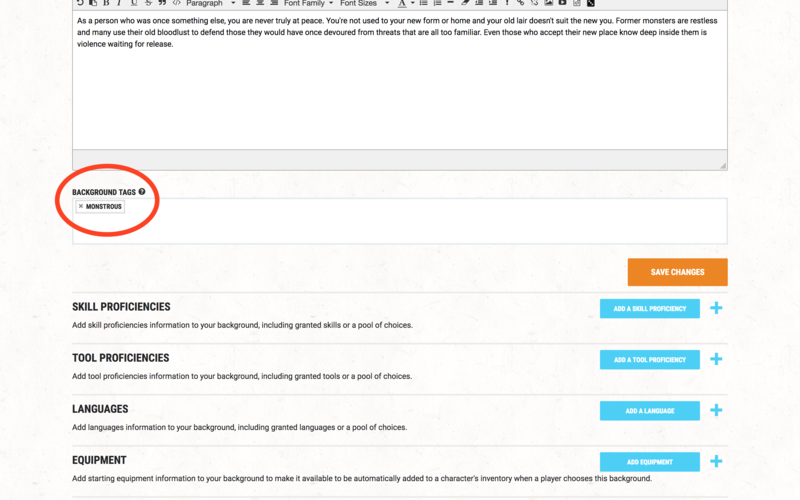 A step-by-step process for creating a D&D background. 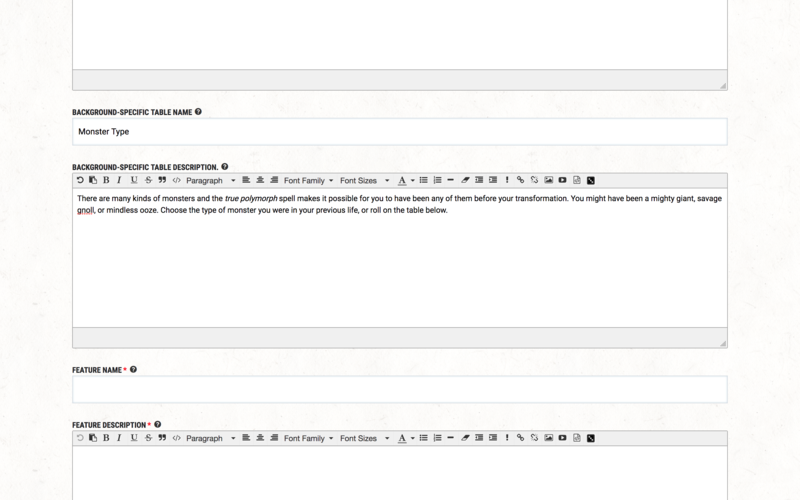 I can’t wait to see what people submit to the great D&D Beyond. If your design gets posted, please share a link with me on Twitter @JamesIntrocaso. Next time in the Design Workshop, I’ll show you how to make a new feat! 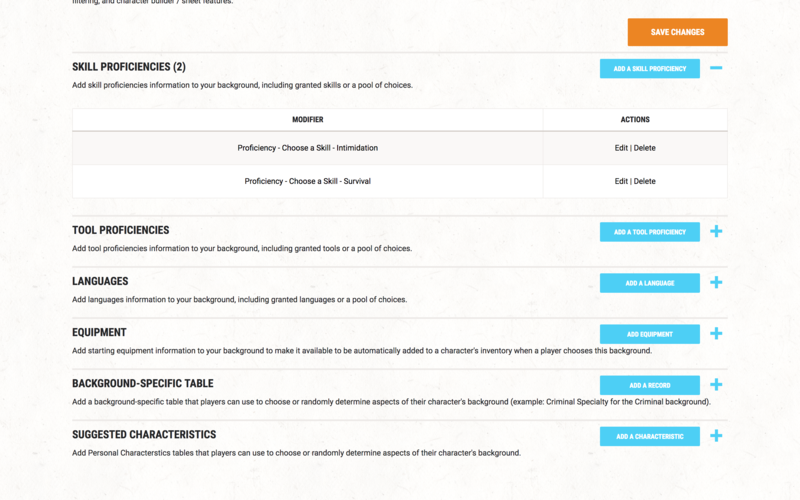 Is there a way in Background or Race creations to be able to make the player select a skill between a determined number of options? In example, make him choose a skill between Acrobatics, Perception or Persuasion? Yes. Where James has entered only one skill twice, you would enter the skills you wish for them to choose from. If they can choose two of those skills, you do that in skill options. Thanks a lot for this step-by-step process information! Could you expand on Step 10: Add equipment please? I found this step very confusing, the way the tool is laid out. I'm loving the daily articles! Gives me a reason to come to the site daily, and expands my knowledge of the site and DnD in general. Awesome tutorial and great inspiration. 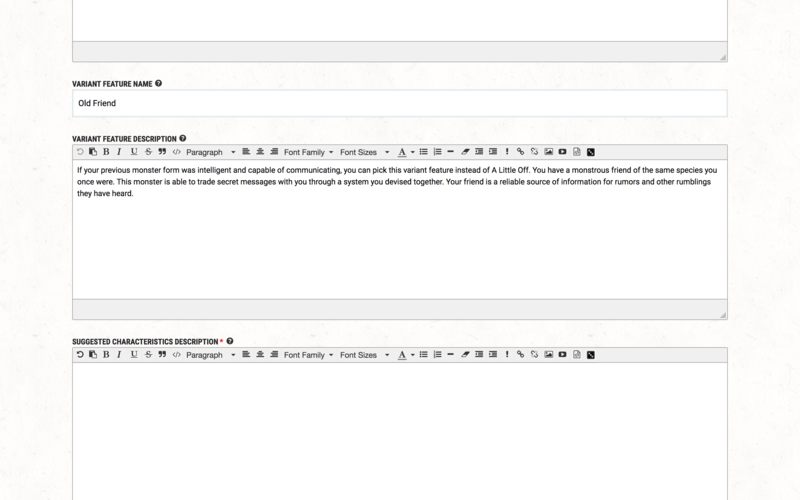 I think it helps to break down the design into its bare components. Loving these articles, geeking out to the max! Keep em coming! I really dig that DDB makes Homebrew and Game Design in general more accessible to players. 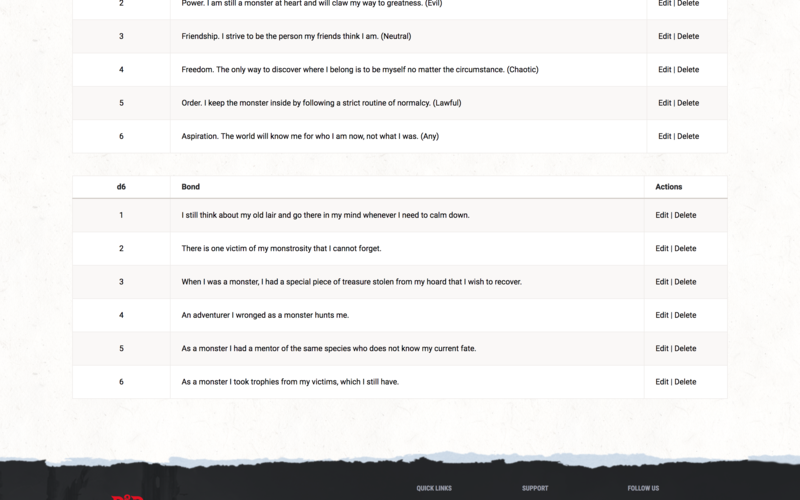 Creating balanced and nuanced player options is a good first start into the profession, and I hope that many more people will eventually learn how to do proper design work, and use iterative design processes to figure out if their stuff works. Really looking forward to your series, ever since Terminally Nerdy mentioned both of us in the Game Design tweet, I had my ears perked up for news about you. Cool to see you on here! Very cool, to say the least. This is great! 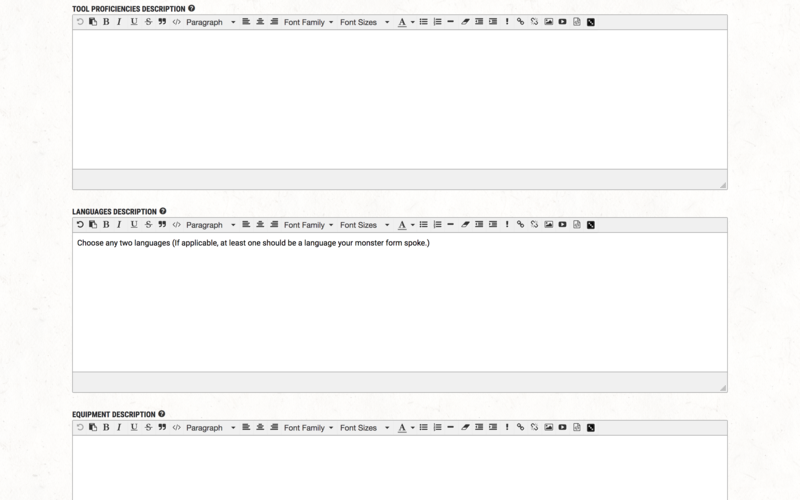 Thank you for sharing these impressive creative tools. I love reading content like this! One addition to step 10: "...except they don't." 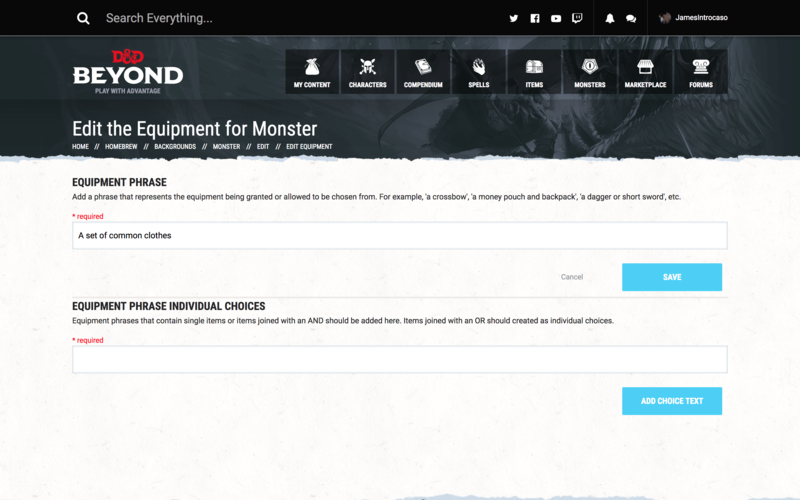 Is there a way to add equipment that is included in "Other Possessions" instead of inventory? Such as the "pet mouse" for the urchin? I made a copy of the urchin background to see if it did anything specific to denote "other possessions" for equipment and all i could see was that it classified those pieces of equipment as "custom", but replicating that in my own background did not work.